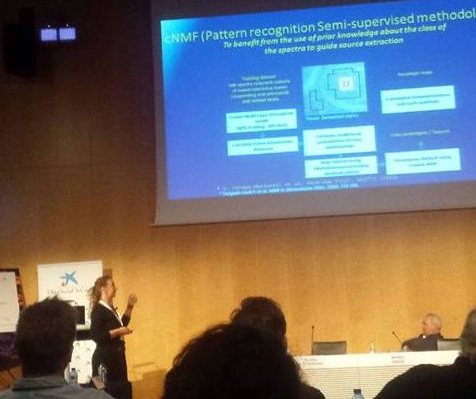 Elisabeth Engel, Scientific Director of Unit 5 of NANBIOSIS, has received an award at EIT Health Spain event held this month at the PCB, Barcelona. The awards have been organized by the Spanish node during 2016 and are part of the financing initiatives of the EIT Health accelerator. Professor Engel participated in the category of ‘Proof of Concept (PoC)” that recognises projects and business ideas that are in stages prior to the creation of the company and projects that are participating in acceleration programs in health. Elisabeth won a prize funded with 25.000 € for Dermoglass, the smart dressing for the treatment of chronic wounds. Dermoglass is a novel and biodegradable nanotechnology-based wound dressing that is able to stimulate the re-vascularisation of the affected area. The restored blood supply promotes the arrival of oxygen, nutrients and new cells, leading to the repair of damaged tissue and healed wounds. Nanomol, (Unit 6 of NANBIOSIS) has announced in Cuba that the process of clinical validation of a new drug developed and patented in collaboration with Center of Genetic Engineering and Biotechnology of Cuba, integrated in BioCubaFarma, has been initiated. The new drug is designed to improve the healing of foot ulcer in diabetics and could be on the market in five years. The collaboration of the Center for Genetic Engineering and Biotechnology of Cuba with Nanomol, coordinating group of Unit 6 of NANBIOSIS, began in 2010. Cuban researchers had developed an effective product in wound healing in diabetics but the product had to be Administered with injections in the affected area. Nanomol obtained a nanoformulation with which it is possible to integrate the protein in a nanovesícula, so that the active principle of its degradation is protected once it is applied in the wound and, in addition, is obtained that the protein is released of suitable form. The results of the work have resulted in a patent and currently the process of validation and scaling of pharmaceutical production is being carried out to bring the product to market. U6 of NANBIOSIS has played an important role in the development of this potential nanomedicine since it enabled a detailed characterization of several physico-chemical properties of the multifunctional nanovesicles used to construct it. Last November took place in CosmoCaixa, Barcelona, the B-Debate Days Imaging for Life. Molecules from Diagnostics and Therapy. The event, organized by B·Debate (an initiative of Biocat and “la Caixa” Foundation), IBB and LJS, was focussed on Biomolecular Imaging, with emphasis on molecular, cellular, tissular and small animal research, as well as biomedical applications, including noninvasive diagnostics, image guided surgery, multimodal imaging and theranostics. -Simó Schwartz, Scientific Director of Unit 20: New bioluminescent models to target cancer stem cells with nanomedicine. -Ana Paula Candiota, Scientific Coordinator of Unit 25: Unravelling therapy response in preclinical glioblastoma using MRSI-based molecular imaging and source analysis. As Professor Candiota explained “Characterization of Glioblastoma (GB) response to treatment is a key factor for improving patient survival and prognosis. Magnetic Resonance Imaging and Spectroscopic Imaging (MRI/MRSI) provide morphologic and metabolic profiles of GB but usually fail to produce unequivocal surrogate biomarkers of response. Ideally, we would like to provide clinicians with early therapy response follow-up and an improved time frame for changing or adapting therapy schemes”. Her talk focussed in the capability of advanced pattern recognition techniques, such as semi-supervised signal source extraction, to produce nosological images with robust recognition of response to temozolomide (TMZ) in preclinical GB (GL261 tumour-bearing in immunocompetent C57BL/6 mice) through the information contained in MRSI grids. These techniques have a clear translational potential and could improve future patient management and care. The acquisition of mice MRSI data used for pattern recognition strategies development and evaluation was performed in the Biospec 7T scanner from U25. 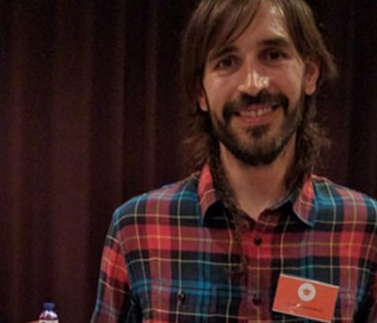 Anton Guimerà Brunet, member of the GBIO group that coordinates Unit 8 of NANBIOSIS, has obtained the extraordinary doctoral award from the Universitat Autònoma de Barcelona for his thesis “Novel methods and tools for corneal barrier function assessment through non-invasive impedance measurements”. This thesis was directed by Rosa Villa, Scientific Director of Unit 8 of NANBIOSIS. The thesis covers aspects of basic research as applied, reaching the transference to the biomedical industrial sector and solving a need in the ophthalmological diagnosis to be able to quantify the degree of corneal permeability. This innovation also includes the development of a flexible microsystem made with microelectronic manufacturing techniques. 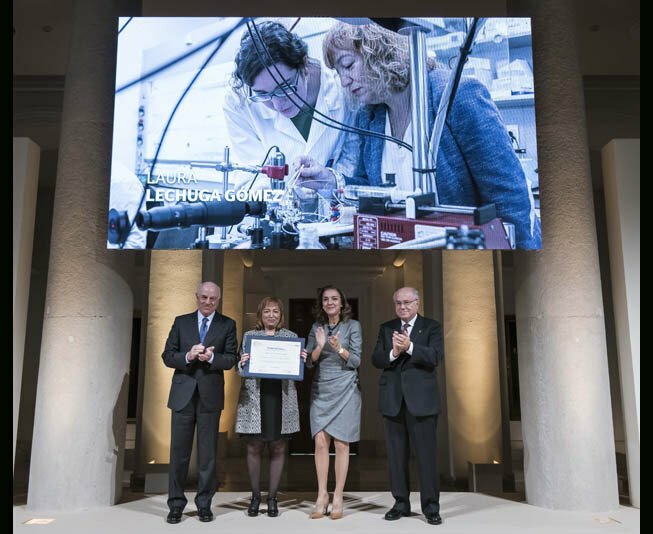 On December 14th, the Physics Awards ceremony was held at the BBVA Foundation’s headquarters, organized by the Spanish Royal Society of Physics (RSEF) and the BBVA Foundation, that each year select the most relevant achievements of Spanish physics. On this occasion the achievements of nanoscience have been recognized and it has been highlighted the power of physics to expand the territory of the known universe and the role of scientists as a core element of social progress. 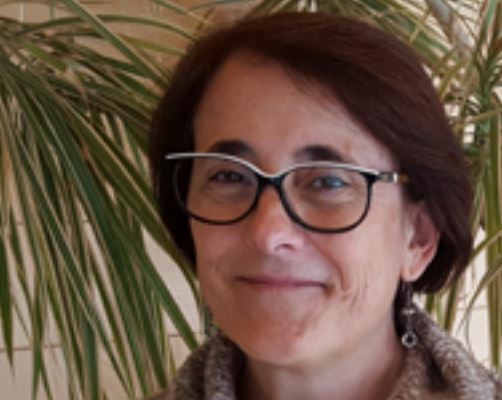 Professor Laura Lechuga, Scientific Director of Unit 4 of NANBIOSIS received the Physics, Innovation and Technology Prize was the only woman awarded. Lechuga is a pioneer in Spain in the development of biosensors, devices that integrate in very little volume the analytical capacity of a laboratory, so they have the theoretical potential to revolutionize many technological areas that have a direct impact on society, from medical diagnosis to control of contaminants in the environment. The award winner works on two prototypes of nanophotonic biosensors to detect colon cancer and tuberculosis: “The future of immediate diagnosis goes through such devices, low cost and very high sensitivity, installed in mobile phones, which could be easily used also in regions in development” says professor Lechuga. 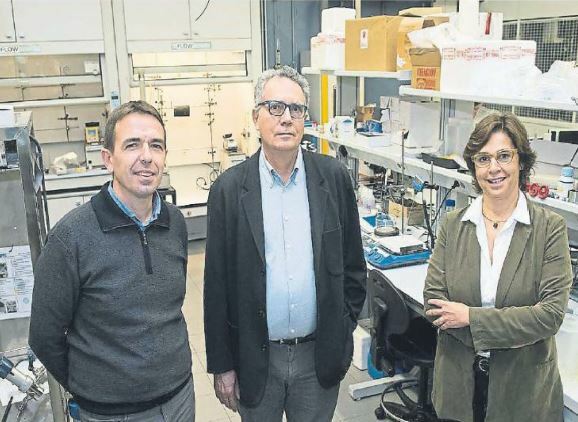 The magazine Viceversa dedicates a special article to María Luisa González, Professor of Applied Physics at the University of Extremadura and Scientific Director of Unit 16 of NANBIOSIS: Surface Characterization and Calorimetry Unit. One of her latest projects, PHYTECH, has developed a new surface for bone implants containing phytate, a natural product found in plant seeds that favours the regeneration of bone tissue and reduces the risk of infections in implants. Now, her research group is about to start a new European project with implant manufacturers in Austria and Lithuania, whose goal is to obtain a crystalline coating for titanium prostheses that favours cell adhesion and prevents or reduces bacterial infections. The research trajectory of Professor González has a clear vocation towards the transfer of results to society. Her driving force in research is to improve the well-being of patients, improve the quality of materials to reduce infection problems after prosthetic and implant surgery, and also help to reduce the cost of healthcare. Her challenge for the next five years is to know better the electrical characteristics of surfaces and how its roughness affect, at nanometer level, to prevent bacteria from adhering to them, without harming human cells. La Caixa has just presented the twenty projects selected by CaixaImpulse in a call with more than 70 proposals from different research centres, hospitals and universities. CaixaImpulse is an initiative unique in Spain that aims to boost research in biotechnology and life sciences to develop projects that generate value in society. Among the selected projects there are two coordinated by NANBIOSIS researchers: Pseudomonas aeruginosa diagnosis led by Miriam Corredor Sánchez (Unit 2 of NANBIOSIS) and ISCHEMSURG, led by Monica Mir (Unit 7 of NANBIOSIS). In addition, the project ExoLiver, in which participates Rosa Villa and the research group coordinating Unit 8 of NANBIOSIS, has been also granted. María Virumbrales, PhD candidate in the research group coordinating of Unit 13 of NANBIOSIS, has been awarded the Prize to the Best Oral Presentation in the I National Congress for Young Researchers in Biomedicine, which took place in Valencia, Spain, on the 28th-29th of November, 2016. The title of the communication was: “Tubeless microfluidic device to mimic tumor microenvironment and monitor cancer-endothelium interactions”. The talk described an in vitro 3D model closely resembling biological tissues and blood vessels, established within a biocompatible material. This model is currently being used to recreate breast tumor microenvironment and evaluate drug efficiency within. Jaume Veciana and Nora Ventosa, Scientific Directors of Unit 6 of NANBIOSIS together with other researchers from NANOMOL group, coordinator of Unit 6 of NANBIOSIS, has recently published an interesting review article in the journal Chemical Society Reviews. 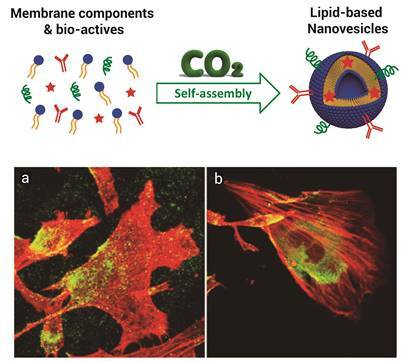 This review presents the large plethora of lipid-based nanovescicles available nowadays, focusing on a new generation of non-liposomal L-NVs and showing their similarities and differences with respect to their ancestors (liposomes). Since the overspread of a nanomaterial to the market is also strongly dependent on the availability of technological-scale preparation methods, it also extensively review the current approaches exploited for L-NV production. The most cutting-edge approaches for their preparation based on compressed fluid (CF) technologies is highlighted since they show the potential to represent a game-change in the production of L-NVs, favoring their step from the bench to the market. Finally, this review briefly discusses L-NV applications in nanomedicine looking also for their future perspectives. Conxita Solans, Scientific Director of the Unit 12 NANBIOSIS is co-author of the research article recently published a research article in the journal Applied Materials & Interfaces. Carbon nanofibers (CNFs) with high surface area (820 m2/g) have been successfully prepared by a nanocasting approach using silica nanofibers obtained from chromonic liquid crystals as a template. CNFs with randomly oriented graphitic layers show outstanding electrochemical supercapacitance performance, exhibiting a specific capacitance of 327 F/g at a scan rate of 5 mV/s with a long life-cycling capability. Approximately 95% capacitance retention is observed after 1000 charge–discharge cycles. Furthermore, about 80% of capacitance is retained at higher scan rates (up to 500 mV/s) and current densities (from 1 to 10 A/g). The high capacitance of CNFs comes from their porous structure, high pore volume, and electrolyte-accessible high surface area. CNFs with ordered graphitic layers were also obtained upon heat treatment at high temperatures (>1500 °C). Although it is expected that these graphitic CNFs have increased electrical conductivity, in the present case, they exhibited lower capacitance values due to a loss in surface area during thermal treatment. High-surface-area CNFs can be used in sensing applications; in particular, they showed selective differential adsorption of volatile organic compounds such as pyridine and toluene. This behavior is attributed to the free diffusion of these volatile aromatic molecules into the pores of CNFs accompanied by interactions with sp2 carbon structures and other chemical groups on the surface of the fibers.